Comprehensive CAT6A Shielded Patch Cable Blue 5ft. 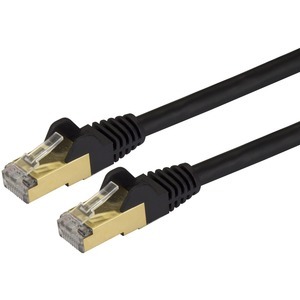 This 5-foot black patch cable is perfect for standard applications such as connecting from a wall jack to your laptop docking station or desktop computer. For easier network installations, our Cat6a patch cables are available in a wide variety of lengths and colors. This ensures you have the right size of cable available when you need it and it lets you color code your connections for a more organized setup. The C6ASPAT5BK is backed by StarTech.com's lifetime warranty for guaranteed reliability.